تلسکوپ‌های ماژلان (به انگلیسی: Magellan telescopes) نام دو تا از بزرگترین تلسکوپهای نوری جهان هستند که در رصدخانه لاس کامپاناس در شیلی قرار گرفته‌اند. این دو تلسکوپ متشابه در سال ۲۰۰۰ آغاز به کار کردند، و هر یک از آیینه‌های مقعری با قطر ۶٫۵ متر تشکیل شده‌اند. تعداد زیادی دانشگاه در استفاده از این تلسکوپ‌ها شریک هستند. دانشگاه آریزونا، مرکز اخترفیزیک هاروارد-اسمیت‌سونیان، ام آی تی، و دانشگاه میشیگان از این دسته‌اند. در ویکی‌انبار پرونده‌هایی دربارهٔ تلسکوپ ماژلان موجود است. The Magellan Telescopes are a pair of 6.5-metre-diameter (21 ft) optical telescopes located at Las Campanas Observatory in Chile. The two telescopes are named after the astronomer Walter Baade and the philanthropist Landon T. Clay. First light for the telescopes was on September 15, 2000 for the Baade, and September 7, 2002 for the Clay. 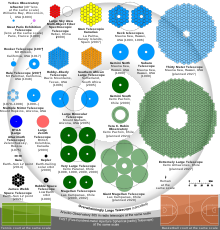 A consortium consisting of the Carnegie Institution for Science, University of Arizona, Harvard University, the University of Michigan and the Massachusetts Institute of Technology built and operate the twin telescopes. The telescopes were named after the sixteenth-century Portuguese explorer Ferdinand Magellan. Is a survey of start searching for planets using the MIKE echelle spectrograph mounted on the 6.5 m Magellan II (Clay) telescope. In 2013, Clay (Magellan II) was equipped with an adaptive secondary mirror called MagAO which allowed it to take the sharpest visible-light images to date, capable of resolving objects 0.02 arcseconds across—equivalent to a dime (1.8 cm) seen from 100 miles (160 km) away. MagAO was originally intended for the Large Binocular Telescope (LBT), but the secondary mirror was damaged before it could be installed. The project leader Laird Close and his team were able to repair and repurpose the broken mirror for use on Magellan II. As built for the LBT, the original MagAO mirror had an diameter of 36 inches (0.91 m). However, the edge of the mirror was broken. Technicians at Steward Observatory were able to cut the mirror to 33.5 inches (0.85 m) in diameter, thereby removing the broken edge. ^ Low Mass Companions for Five Solar-Type Stars from the Magellan Planet Search Program, Dante Minniti et.al, 2008. ^ Five Long-period Extrasolar Planets in Eccentric orbits from the Magellan Planet Search Program Archived 2012-07-11 at Archive.today, Pamela Arriagada, et.al, 2010. ^ New Telescope Tech Takes Sharpest Night Sky Photos Ever, Mike Wall, 2013. ^ University of Arizona astronomers see more clearly than ever, Tom Beal, 2013.